Netgear has announced a new Network attached storage (NAS) device for the home – with the 1TB Stora aiming to make things easier for the average user. NAS has yet to truly make the jump into the mainstream, but the principle of allowing users to easily share and access their digital data without uploading is increasingly attractive. 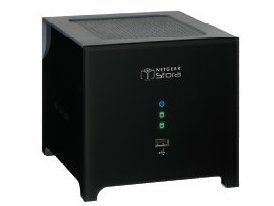 The Netgear Stora device offers a simple web-based GUI that should allow users to quickly get to or share their files. "We strongly feel that Stora exemplifies the next-generation of consumer storage devices," said Drew Meyer, director of marketing for Netgear's Network Storage Business Unit. "Netgear has already made its mark in the business and prosumer market with our ReadyNAS line, but Stora is most definitely a platform for everyone. "Stora gives users the features they need today with a consumer-friendly user interface and price point, making their media available to them and their designated friends and families anytime, anywhere - even on smartphones. "It truly sets a new bar for the consumer network storage market." The Stora device also comes with an extra drive bay to allow people to expand beyond the included terabyte and has a UK release date of early October with no price yet announced. In the US the drive will cost $229 (£141) plus $19.99 (£12) for an annual premium service that includes 'additional remote access and third-party service integration such as Flickr, Picasa, YouTube and mobile phones'.